Our crew management software handles your resource planning and payroll. Easy, visual and includes vessel client. See how our Crew Management software can help you! The crew members can be displayed as a table or as a business card. Both views are fully customizable and can be adapted to the needs of your company. With the payroll module of our maritime software you can manage individual contracts based on predefined templates to calculate monthly and final gross wages. Additionally it handles fixed salaries and all kinds of variable items (overtime, slop chest, communication etc. ), and calculates leave pay and allotments. After the approval process, a pay slip is generated. The data can then be passed on to your accounting software. You can group and sort within all grids of the crew management software, and you can create and save special filters using a range of logical commands. To harvest information, we provide a special report designer, allowing you to display—for example—crew contracts. The maritime-management-center enables third parties like crewing agencies to access their crew members online, in order to update crew certificates and so forth, saving you effort. 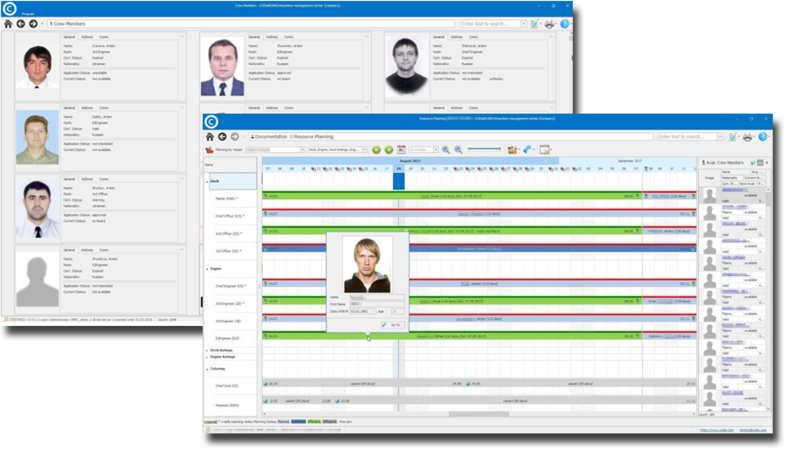 Furthermore, third party systems can be integrated into our crewing software, e.g. for importing the fleet’s sailing plan, or for sending pay slips to an accounting system for net calculation. We created every line of code in this software with the intent of making your crew management a convenient experience. Every click takes time away from your crew managers. We have reduced the effort required to handle this software down to a minimum. It is logical, easy to understand and contains intelligent automation ranging from warnings to crew member suggestions. The maritime-management-center helps your crew managers to stay compliant with STCW, MLC2006 and your company’s standards and procedures of the QHSE / ISM. Our software matches individual qualifications with predefined requirements in order to enhance resource planning through automated searching and warning functions. Thus, if a crew member does not meet your on board requirements a warning is shown. This might be a missing certificate or a restriction set by the crew member himself (e.g. vessel type).